I bought this fixture for my granddaughter’s room. She has lovely pale pink walls and this added so much Texture to her room. She feels like it is made of jewels. Great for adding a touch of glamour. Illuminate your favorite room with the timeless elegance of this beautiful chandelier. The impressive fixture features an intricately detailed round iron frame in an antique black finish, and rows of geometric crystals that drop down and join to a pointed finial to form a sparkling basket. The three-light chandelier mounts flush against your ceiling. · ceiling plate: 7.9 inches x 1 inch H.
I started my search looking at high-end shops, but the sizes, height or color of their lamps just wasn't working with our scheme. 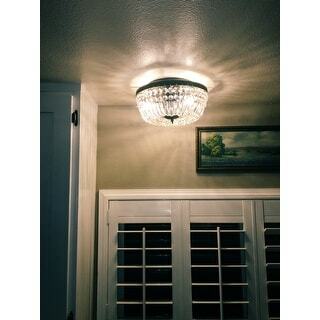 I was so ecstatic to find this affordable light, with the perfect dimensions, here on Overstock. I figured I'd just take a chance and return it if it looked too cheap. I didn't return it, but I did buy a second light just like because I love it so much. The pattern from the crystals is beautiful. We've already got so many compliments. I think this is my new go-to lighting store! 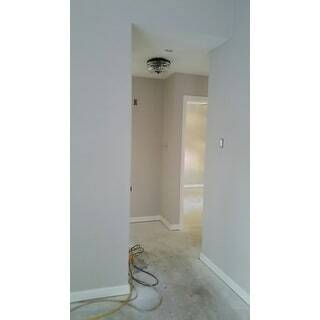 I purchased this fixture to be installed in a small hallway in my home, after my home was redone due to a fire. It was a little larger than I expected, even though I had looked at the measurements listed here. The fixture is very nice and I am sure it will look even more beautiful after I get electricity turned on and can actually see it lit up. 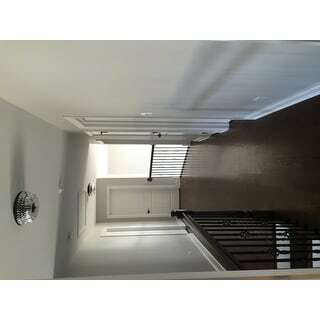 I have attached a photo of what it looks like in my home as we wait for the rest of the house to be finished. Elegant flush mount chandelier. Comes unassembled but don’t be intimidated. Easy to connect crystals AFTER installation. I made the mistake of connecting crystals before installation and had to redo most connections after chandelier was installed. Directions even state to install first, assemble second. My goof! Adds such a beautiful touch of sophistication to my entryway. Recommended for those who want to glam up their space. I purchased this chandelier to hang above my kitchen sink and it's beautiful! The crystals reflect in a very cool way and I love the way it looks from every view (looks really cool from outside the kitchen window!). It actually puts off a lot of light with the 40w bulbs I used, so I will either change the bulbs to 20w or add a dimmer to the switch. It wasn't at all hard to hang the crystals - first couple were slow and then it goes quickly as you get the hang of it. I would love to replace all my flush mount fixtures with this! 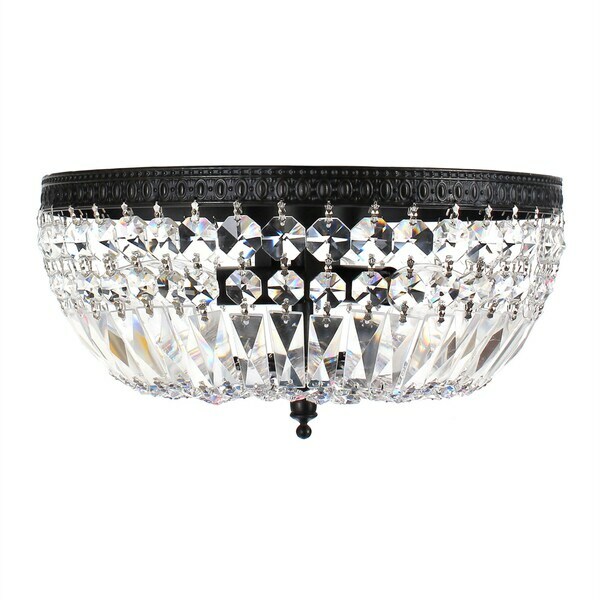 decided to purchase 2 of these flush mounts to go with its sister flush chandelier for my hallway AND WOW... the black metal with the faux crystals...really sparkles. Easy to install, a lot to assemble - the faux crystals have a delicate metal clasp that easily unhooks, so piece by piece we bent and tightened each one. 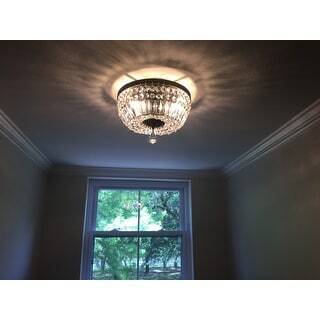 I ordered two of these for my home to replace the standard contractor ceiling lights and love them! Very easy to install and came with a few extra crystals just in case. Highly recommend! Also, picture doesn't do them justice, very pretty in person. I used LED lights with them. Stunning and look more expensive than they are. 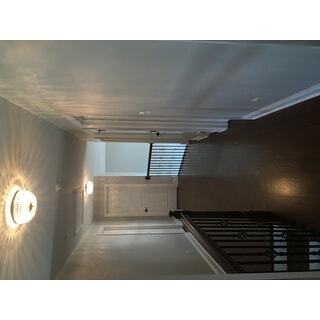 We have three of these in our front and upstairs hallway. Elegant and not too bling-y or overbearing for 8 inch ceilings. Love this beautiful chandelier. It is gorgeous, gives off great light. I used led lights with warm glow. I added the bottom crystal from an extra off of another fixture. Very elegant looking light fixture, got this for our hallway and already gotten a few compliments, easy to assemble, great value for the price. This lamp is simply gorgeous. I bought for our Art Deco home and it fits right in. Crystals cast a lovely light on the ceiling as well. A favorite purchase. Like jewelry for my room. I did have to attach each strand of crystals but I did not mind that. Fixture is beautiful! Brings just the right amount of glamour without being ostentatious. Love the way it allows the light to play through the crystals! This product turned out to be exactly as described, and then some. All parts were unbroken and packaging was intact. We bought this to closely match an existing one in our home that was installed in 1965. It gives off beautiful light as it hits the prisms from the glass. Well worth the purchase price! I don't like this product and would not buy again simply don't like the design it puts off in the room at night. "This fixture looks like it takes night light bulbs. What bulb do I use that will give me enough light in a laundry room?" "How come I see in the reviews photo's that do not match the product? I see a large round crystal hanging from the center in the pics below but don't see that in the actual pic from Overstock?" This light does not come with a large round crystal ball. 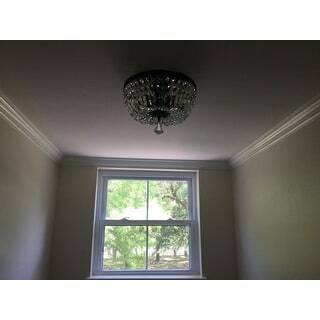 The customer who posted a photo added the bottom crystal from an extra off of another fixture. The picture on Overstock is correct, which matches the product. You are able to purchase an extra crystal ball to hang it from the center. "Would this fixture work on a large, deep soffit in a laundry room?" This fixture would not work on a large, deep soffit in a laundry room. Yes, I think it would look gorgeous. I have 2 in the hallway, and they look great. The fixture is about 12" in diameter, so as long as the space is that size or bigger-then i would think it would work. If the area is smaller, i would suggest a semi-flush fixture as it wouldn't need as much surface area. "Why isn’t it safe for a bathroom? Thanks "
This fixture will rust easily in a damp location. "1. Can you use regular LED bulbs with this fixture? 2. Do you have to remove crystals to replace bulb?" Yes, you can use LED bulbs with this fixture. Please note: the bulbs need to be fit for the E12 light sockets. You have to remove some crystals to replace bulb, but there is no need to remove all of the crystals to replace bulb. I used led lights and they look great- i used a 40watt as the 60 was too bright for the fixture- with the 60watt i could see individual bulbs through the fixture- the 40watt avoids this and looks great! To change the bulbs you just gently move crystals aside like a curtain- no need to remove anything to change bulbs! Yes, this fixture is dimmable, but you need to install a dimmer switch. "Would this look good or give enough light in kitchen? Provide enough light. I would have to install"
Yes I put this light in our kitchen and it looks great. I think it gives off more light than the old fixture that was there before. Plus it casts cool shadows on the ceiling. My husband installed it, was pretty easy I do believe. I would recommend additional task lighting. I have this fixture in my bathroom, but with additional sconces above the vanity.